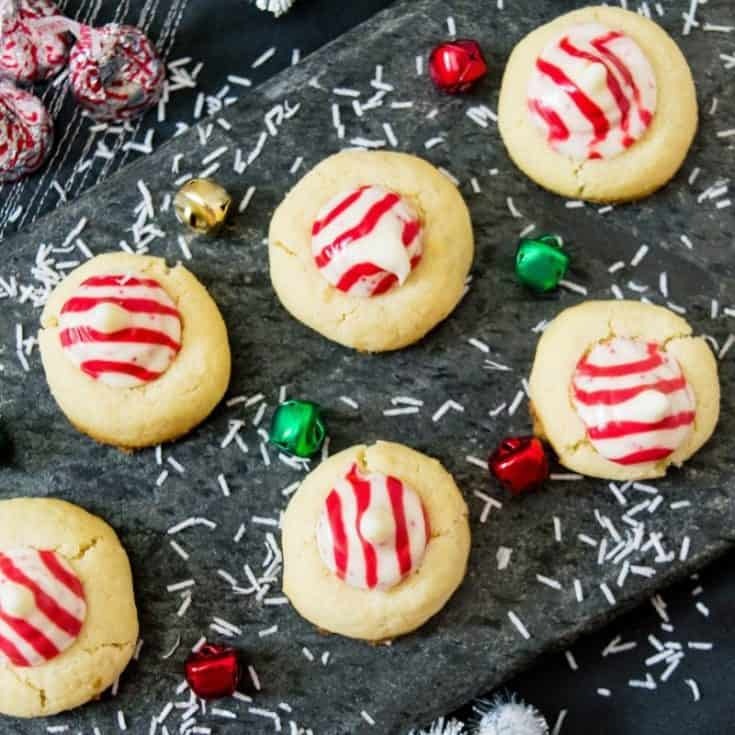 Not only do these Candy Cane Kiss Cookies look festive, but these holiday cookies have a festive peppermint flavor as well. Who doesn’t love holiday cookies? Baking Christmas cookies is one of my favorite events of the year. 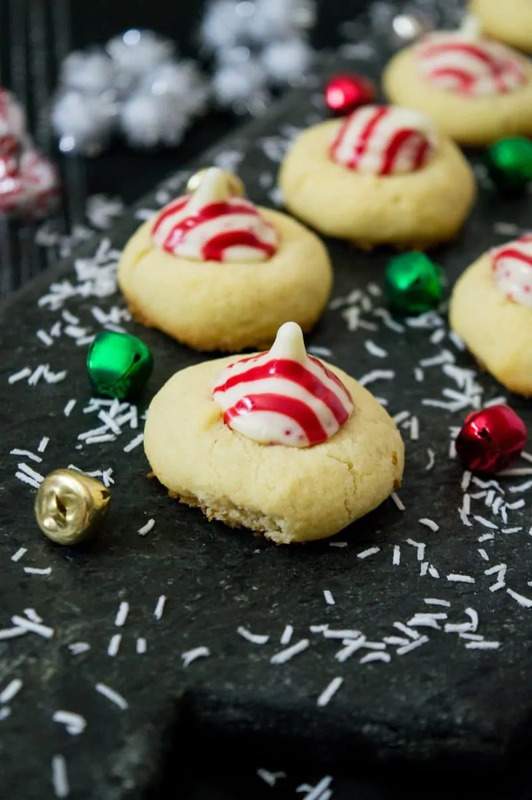 Of course you have your traditional chocolate chip, oatmeal, and sugar cookies… but, if you’re looking for something new to try, you’re going to love these candy cane Hershey Kiss cookies. 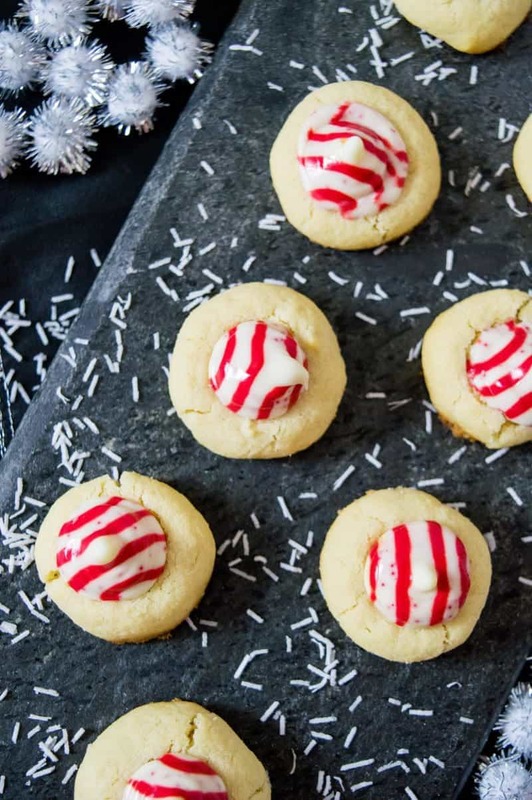 The Candy Cane Kisses on top give the cookies a festive look as well as a festive peppermint flavor. You will love how easy these Candy Cane Hershey Kiss cookies are to make. 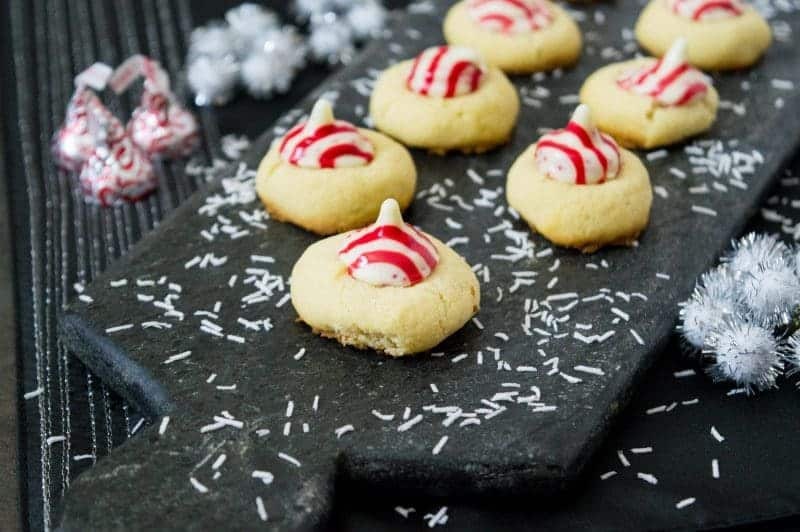 Whether you’ve got an entire day to devote to baking Christmas cookies or you are short on time, you’ll have no problem whipping up a batch of these fun Hershey Kiss candy cane cookies. You’ll also love how beautiful these candy cane cookies will look on your Christmas buffet table or inside any treat bag or box. 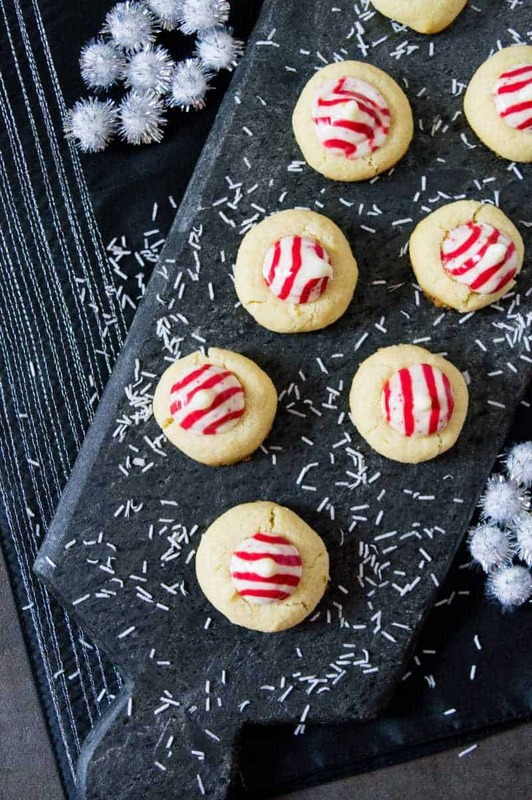 Speaking of treat bags and boxes, these candy cane thumbprint cookies would make an excellent homemade holiday gift. Add some tissue paper to a gift tin and then nestle the Candy Cane Hershey Kiss cookies inside. Or you can place them inside decorative cellophane treat bags or treat boxes. Either way, these delicious holiday cookies make an excellent gift for neighbors or coworkers. If you’ve got a large crowd to feed, you will want to make multiple batches of this Candy Cane Hershey Kiss cookies recipe. Trust me, these cookies are so good that everyone will want several! If you have kids, you can even dress these cookies up a bit more. Simply roll the dough balls in colored sugar before baking or adding food coloring to the dough. This will add a pop of color that your kids will love! I hope that you enjoy this delicious holiday cookie recipe and that you have a very happy holiday season! 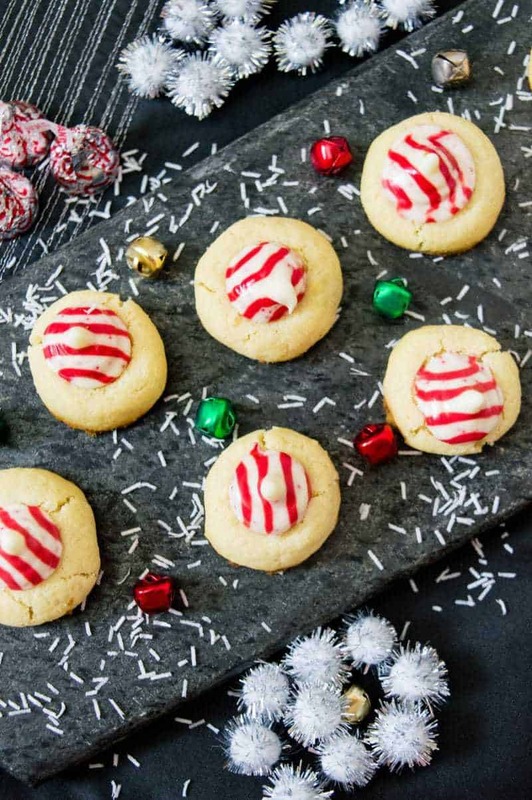 Not only do these Candy Cane Hershey Kiss Cookies look festive, but these holiday cookies have a festive peppermint flavor as well. In a large bowl, beat butter and sugar together until light and fluffy, about 3-4 minutes. Add in the egg yolk and vanilla. Beat until well combined. Add in flour and beat together until all the flour is wet and mixture is combined. Do not over beat. Onto the top of each ball, gently press with a thumb or finger to create a crevice. Bake for 12-15 minutes. Once cookies are slightly golden brown take out of oven and immediately add one Candy Cane Hershey Kiss to the center of each and then allow cookies to cool for 10 minutes before serving. Mmmm!! These are one of my favs!! I love that you used candy cane kisses!! Too cute and I love mint and chocolate!! These are one of my favourite Christmas cookies. So yummy! Yum! These would be perfect to add to my holiday cookie list. Thanks!! These are so festive and cute! I have been trying to think of something different to take to a Christmas party. I think I am going to make these.. great post! I make these kind of cookies every year for the holidays. They are really simple and leave quite a bit of room for personal touches to make them different every year. And everyone loves them! These look delicious! They would make great Christmas gifts too. These look so scrumptious! Do you think it would be possible to substitute all-purpose gluten free flower? I haven’t tried myself but I don’t see why not!